A round of showers, mild air and fog is expected prior to a sharp chill. Some of the coldest temperatures so far this winter are anticipated into early next week. Today and Tonight: A weak storm system will cross the area from west to east on Thursday. Spotty, light rain showers are expected, especially early. Beyond this, some breaks in the cloud deck are possible with highs climbing into the upper 60s. This mild air will lead to fog formation overnight, possibly dense in some areas. Lows will stop in the mid 50s. Up Next: Showers will push onshore on Friday ahead of a much stronger system that will move in from the west on Saturday. High temperatures will chug into the low 70s on Friday. A strong cold front will bring showers and gusty thunderstorms on Saturday morning. The front is expected to move quickly, with clearing skies and rapidly falling temperatures into the afternoon. Temperatures will plummet into the 30s by Sunday morning and 20s by Monday morning. 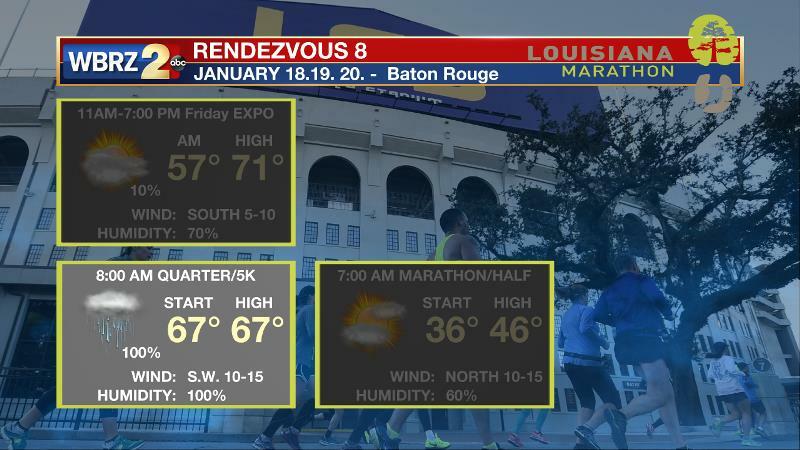 Louisiana Marathon: Weather will be cooperative for The Expo and Sunday's Marathon and Half. 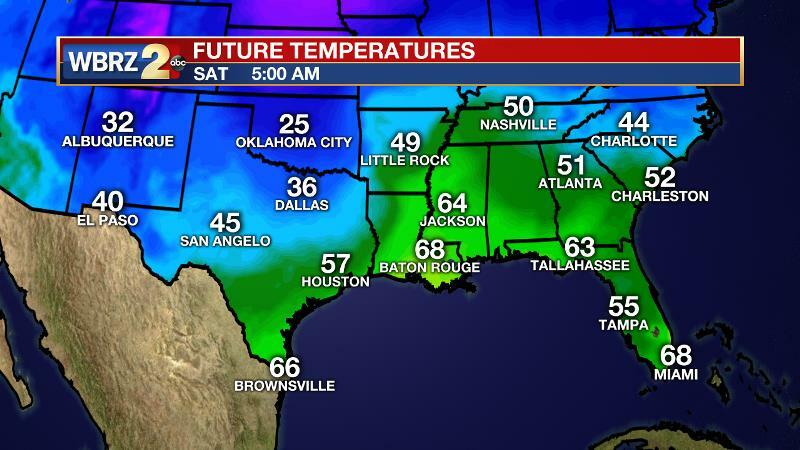 On Saturday, the Quarter and 5K could meet some issues in the face of a strong cold front timed for the morning hours. Gusty thunderstorms and heavy rain could necessitate some schedule adjustments, as the second half of the day should bring returning sunshine and breezy conditions. Expect dense fog to develop overnight as warm air moves over cool lake water. Into the weekend and next week, the pattern will stay fairly active. The focuses will be any stronger storms with a frontal passage on Saturday and much colder air that will follow. As far as the storms go, this particular setup is one of our typical low instability, high shear situations. The Storm Prediction Center has highlighted the entire forecast area in a 1 out of 5 “marginal risk” for severe weather on Saturday as the cold front moves through. Models are in good agreement timing the heaviest rainfall for early Saturday morning through noon. Overall, this threat does not appear to be major, but at least a small threat of severe weather is there. Gusty wind appears to be the main threat if any storms turn severe. After the front, arctic cold air advection will take shape and continue through Sunday. The cold blast will be short lived as thermometers will quickly rebound on Monday. Sunday night into Monday will be the coldest period with most locations reaching freezing north of I-10. Some 20s are anticipated into southwest Mississippi. A surface high will shift east allowing southerly winds and moisture to return to the area ahead of the next storm system by the middle of next week.